Bathing Place Dress, 1810, from The Repository of Arts, Literature, Commerce, Manufactures, Fashion, and Politics. This unusual outfit features lace-trimmed pants as an undergarment that shows beneath the simple button-up-the-front dress. The laced sandals show the Greco-Roman influence on dress. 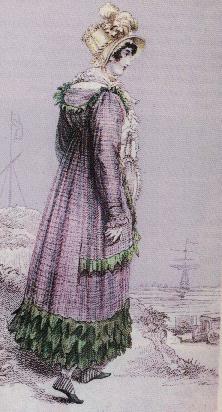 Seaside Bathing Dress, 1815, from La Belle Assemblee, or Bell's Court and Fashionable Magazine Addressed Particularly to the Ladies, 1806-1868. 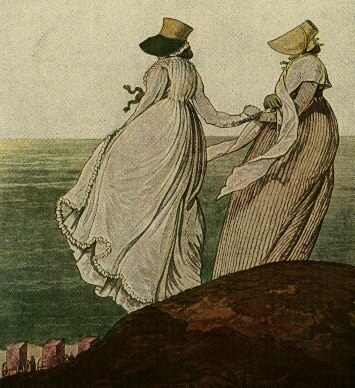 It is unclear to me if this dress is simply to be worn to the bathing machine, which can be seen in the lower left of the picture, or actually into the sea. Most likely the former, since the bathing machines acted as changing rooms as well. Note the odd green and white slippers that match the dress, which is purple with green trim. Morning Dress, 1797,, from Nicholas Heideloff's Gallery of Fashion, 1794-1802. These ladies have gone out on a windy morning for a walk. They have on bonnets, and one woman wears a shawl over her morning dress. It is possible they intend to go bathing in the sea, as we see the bathing machines in the bottom left corner of the image.